Some of you are probably applying to HBS at this time. It’s a wrestle against standardized exams such as TOEFL and GMAT, nights spend on essay writing (and mostly re-writing) and tons of mock interviews before clearing the last interview hurdle. All of these efforts serve only one goal – to stand out amongst the thousands of applicants. Those of you that manage to make it beyond the admissions cliffs will be part of the next HBS class. Congratulations. And here you are, amongst the ‘survivors’ of this competitive selection. And again, it’s about standing out. You can do so by being the master of parties, or being vice-president of one of the clubs. A more academic approach of standing out however would be through grades and honors. Here’s how this works at HBS. While grading can vary among courses, class participation typically accounts for 30 to 50 percent of a course grade, with the balance taken from exams. Class participation is probably the most tricky one to nail. It’s about finding the right balance between quantity and quality of comments. Getting to speak in class and thus add up to your quantitative class grade is not obvious. As classes are moderated by professors, it’s about finding the right technique to draw the professor’s attention and to raise your hand on the best possible moment. Don’t go for the overflow (having your hand up all the time will not help you getting called). Other try to get called by increased gestures or by continuously staring at the professor. From my experience, it’s more about raising your hand when things get more technical and thus there’re less ‘hands in the air’. As such, my advice would be not to waste your call on the obvious comments. Focus on value add! Quality of comments is obtained mainly by taking a strong stand with measurable arguments – preferably something that will launch or further advance the discussion in class. For those wondering how the professor keeps track of all that, I can say that every class has a scribe taking notes. While the details of these notes are probably a well-kept HBS secret, they are a tool to remind professors which student made an intelligent comment in class… and who messed up. While class performance is a daily headache, every couple of months there is a series of exams. They come in multiple formats: group work, multiple choice exams or essays. 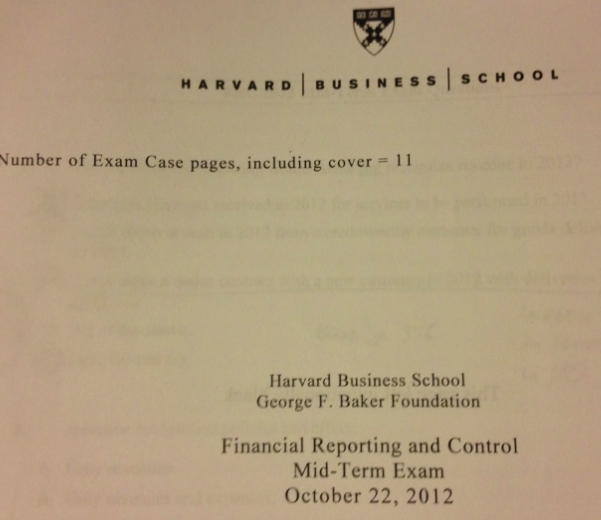 I was surprised by the overall setting of the HBS exams. Some can be taken at a location of your choice as long as the answers and/or essays are uploaded online within the assigned time limit. Others have to be taken in the classroom. In the latter case, students are packed on one another and left without any attendance of professors or assistants in the classroom, leaving a lot of room for potential cheating. HBS seems to trust in students to respect the HBS values of honesty and mutual respect. It’s a very different experience from my former college exams in Europe, where students would be spread out over a room to avoid the possibility of cheating. Left alone the fact that students would be left alone in a room without any ‘academic surveillance’. Overall I am very positive about the HBS grading system. As described above, 90% of students will have a grade in either category I or II, removing a lot of the stress related to exams. Compared to my European college experience, where up to 50% of students would fail certain classes, the HBS grading method allows for more focus on learning rather than proficiency in taking exams. As a student, I am very happy that the focus of my academic HBS experience is on the former and that I’m not spending 200k$ to learn how to do well on exams. This entry was posted in The HBS experience and tagged admissions, calling, class participation, exam, grading, HBS. Bookmark the permalink.